However, I will say this about Indian-Wacko-Cricket-Mania (or, IWCM): When India wins, they sure do let off gigantic amounts of fire works, and there's a good bit o' public drunkenness. A dangerous combination, you might say, though, after the fashion of things over there, it's not quite as dangerous as it might seem at first. It's pretty great, actually: People are shooting off these artillery rounds that would be totally illegal in Delaware, right from their roof tops. And all at once, the whole sky-line explodes in this gigantic 360 degree fireworks display. It looks like footage from the First Gulf War. It's all quite awesome, and, frankly, if that was how people celebrated sports in the U.S. I would be much more inclined to care....it would be nice to have an excuse to shoot off giant dangerous fireworks, without the threat of the cops cracking down on you... "Oh well..." he sighed wistfully. Anyway, the day after India beat Pakistan, I revisited the town of Amber. 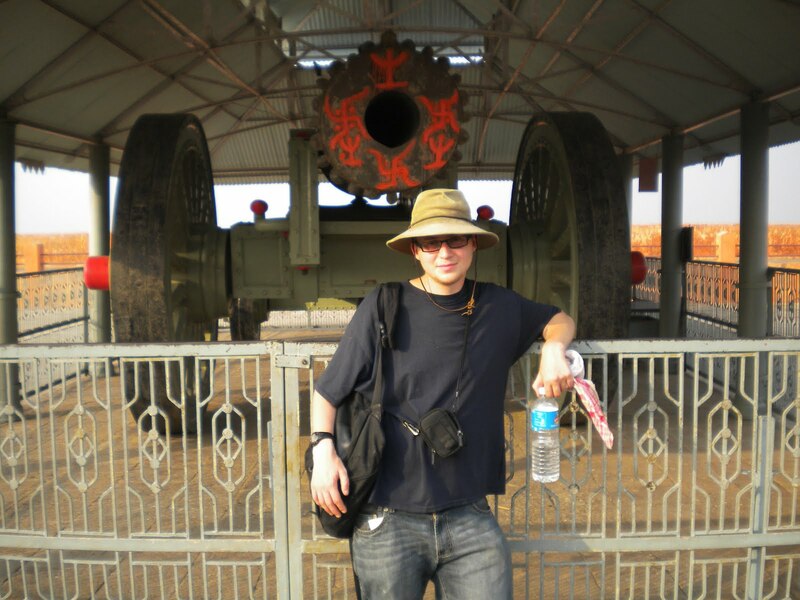 I had been there before in 2009, but, again, only for a very short time. This time I got to wander about as much as I pleased. 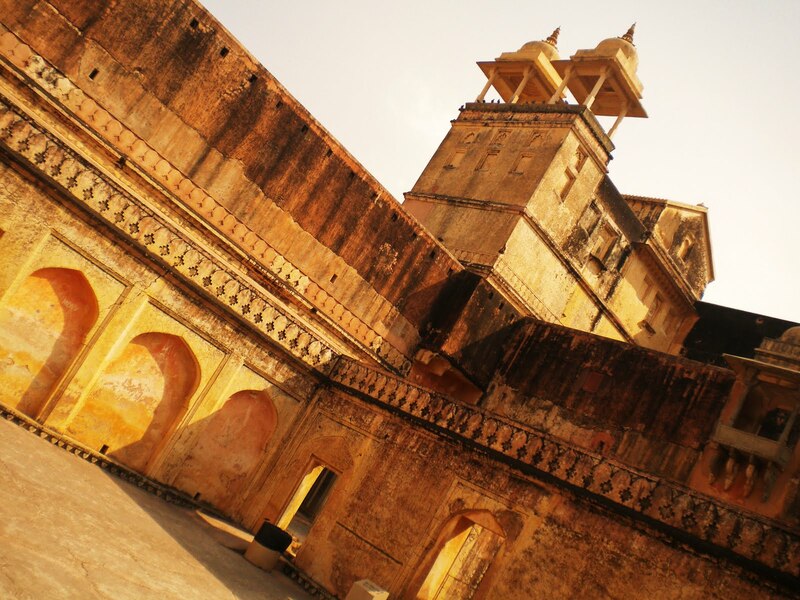 I have to say, visiting a fort is exactly the sort of thing which is done best with very few people. 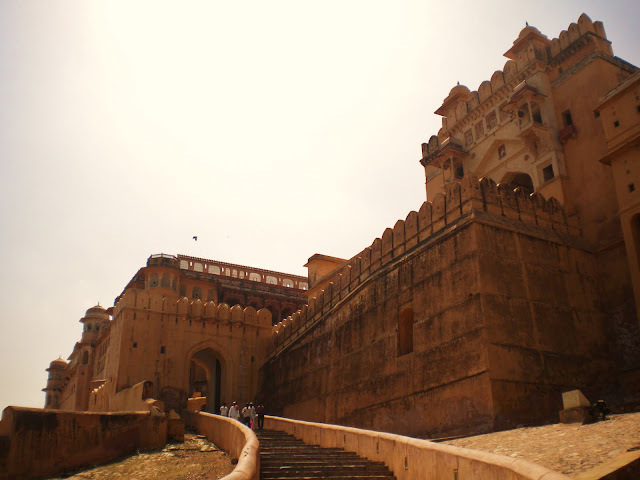 The other two times I've been to Amber fort, it's been with a tour guide and gigantic crowds of college students. That leaves almost no room to explore properly. Defensive wall along the crest of hills around Amber. 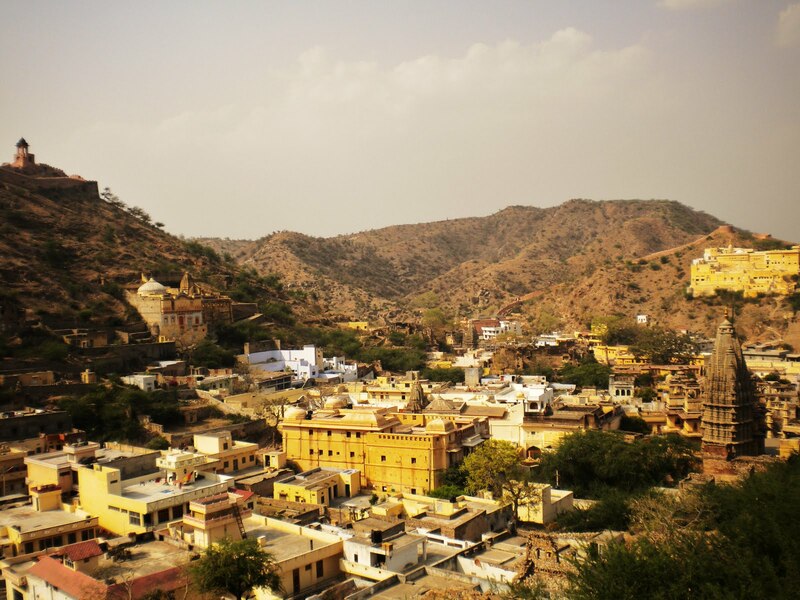 The little town of Amber is about 11km from Jaipur, and it's where the ruling clan in Jaipur, the Kachwahas, were based from the 11th to 17th century, before they moved to their present locality . 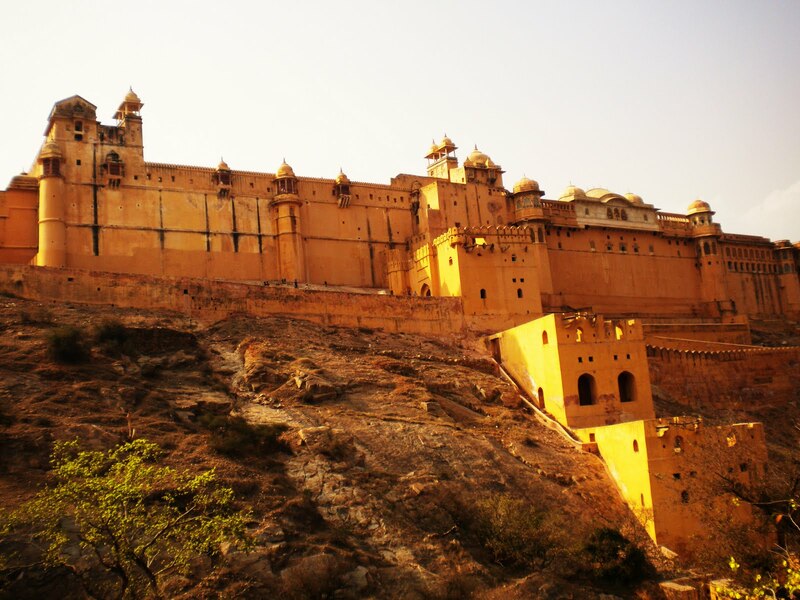 What it's most well known for is Amber Fort, which is rather more like a huge palace than a structure genuinely meant for defense. 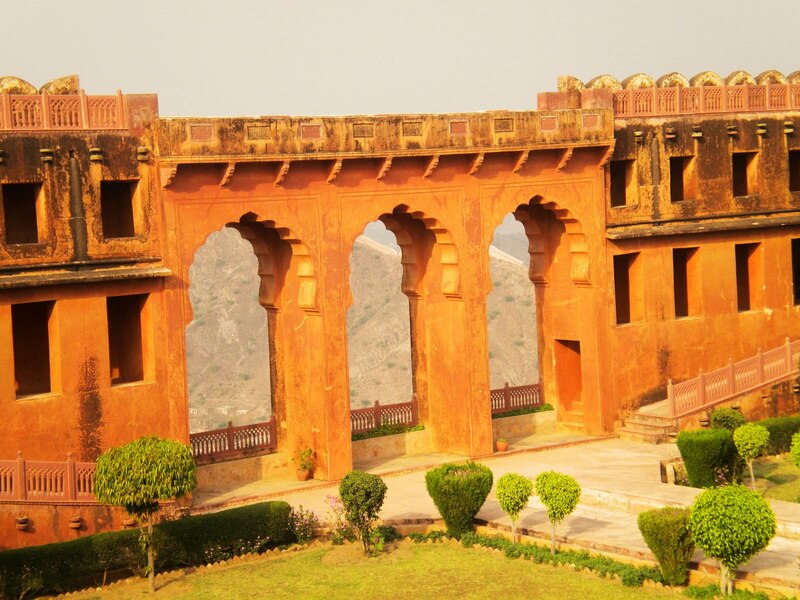 There's another, later, structure in Amber called Jaigarh Fort, which was built onto a hill about 1000 feet above Amber. That one seems much more like it was meant to keep people away. 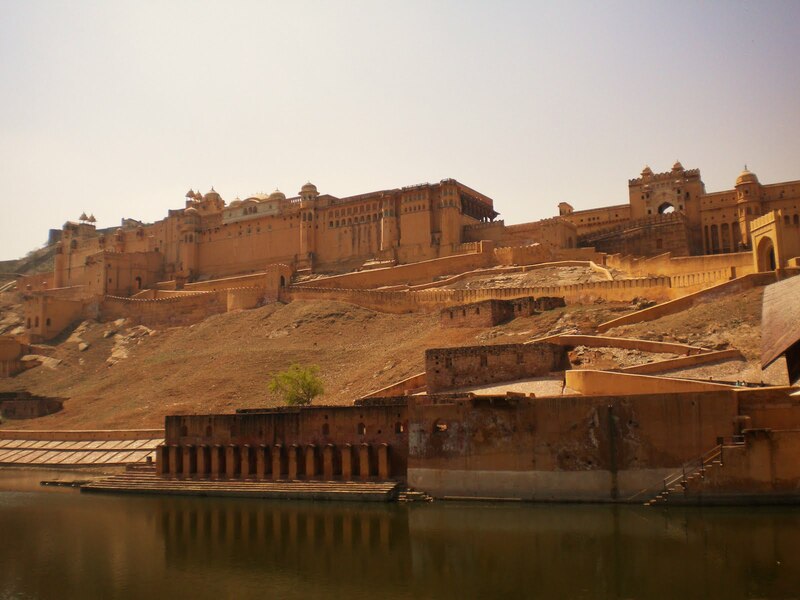 Amber has apparently been occupied for quite some time, the current fort having been built on the ruins of a palace constructed by a group of people called the Meenas, who have inhabited the deserts of Western India since time in memorial. Looking up at Amber Fort from across Maota Lake. The way up to the first gate...in the winter they have elephants which take you to the gate, but I guess they don't do that when the temperature goes up (this was in March, but it was already in the 90s during the day). I prefer walking anyway. I remember taking elephants up in 2009 and finding it rather unpleasant and distasteful...the elephants didn't seem to be well cared for, and guys beside the stairs were constantly bothering you to buy junk or have your picture taken. A small courtyard in Amber Fort, in the wall behind the Diwan-i-am (public audience hall). 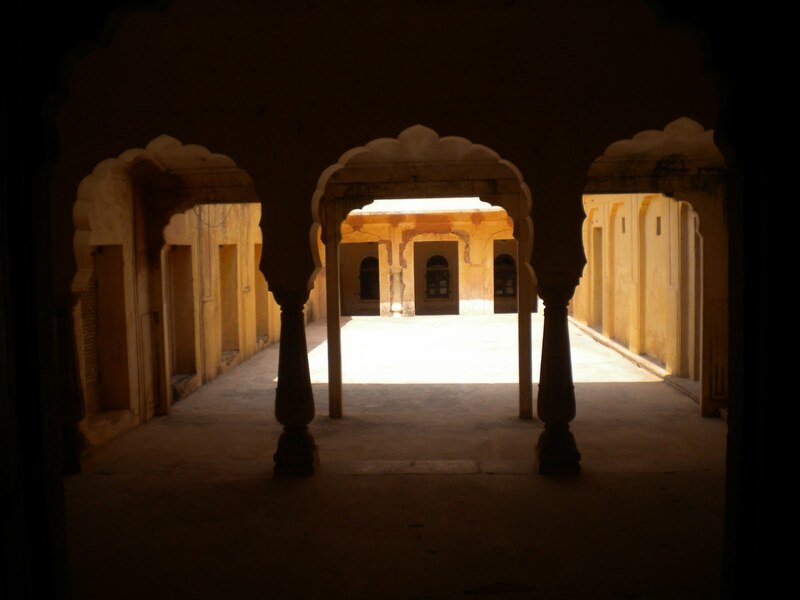 Looking out from a gallery behind the Public Audience Hall (Diwan-i-am) of the Second Courtyard. Amber is arraigned around in four levels, each with its own courtyard, with most of the enclosed rooms built into the walls. I didn't know it at the time, but I don't think I was supposed to be here...though there wasn't anything to indicate that. In the high season, there are armed guards all over the place who tell you where to go and where not to, but there weren't as many when I was there in early April. Creepy corridor under Amber Fort. This is where Bruce Willis would be hiding out if the fort were taken over by terrorists. This area, in times of yore, serviced the Forts' extensive waterworks, with which water was brought up from Maota lake all the way to the highest level of the building through a series of shafts. I just sort of wandered down here. I get the impression this area of the fort doesn't get too many visitors. 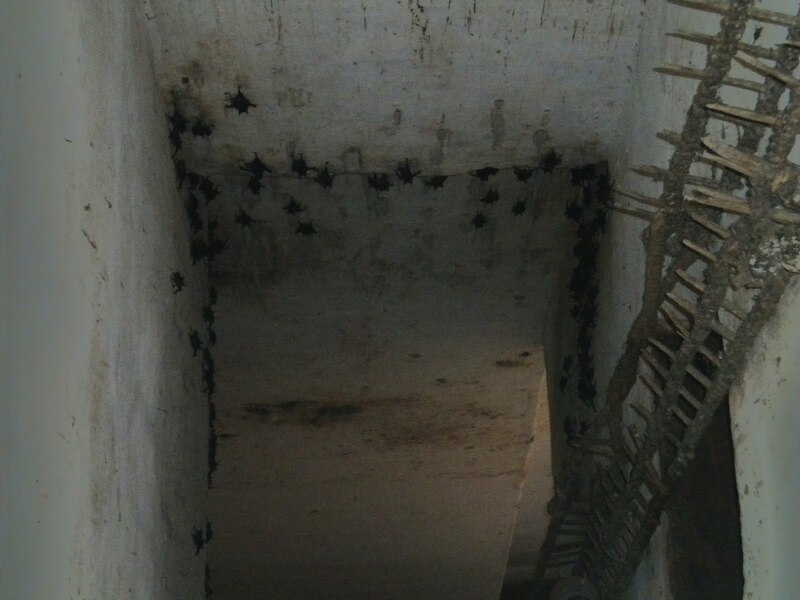 All of these rooms were infested with hundreds of bats when I was there, which added to the atmosphere (and lent a distinctly unsanitary touch). 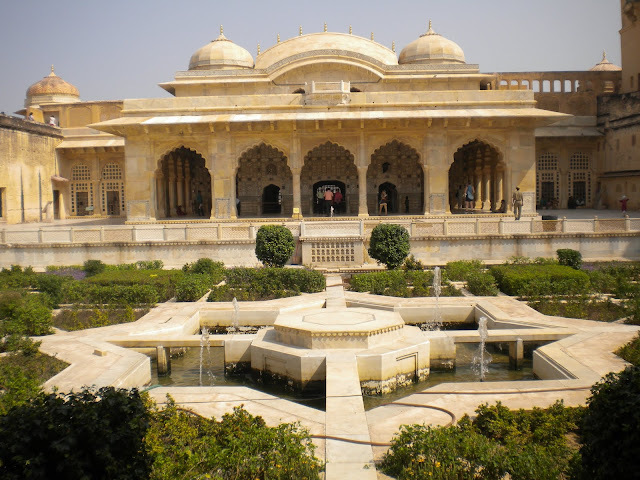 View across the third courtyard garden towards the Sheesh Mahal, or Palace of Mirrors. The garden is modeled after Mughal examples, though I assume the Rajputs, being Hindus, weren't interested in the Islamic symbolism. This is the part of the fort that the Maharaja and his family occupied. There's a weird old Indo-Soviet co-production film from the 80's called "Ajooba" with scenes filmed here. Amrish Puri (the main bad-guy in "Indiana Jones and the Temple of Doom") stands around in it, looking most evil and bug-eyed. 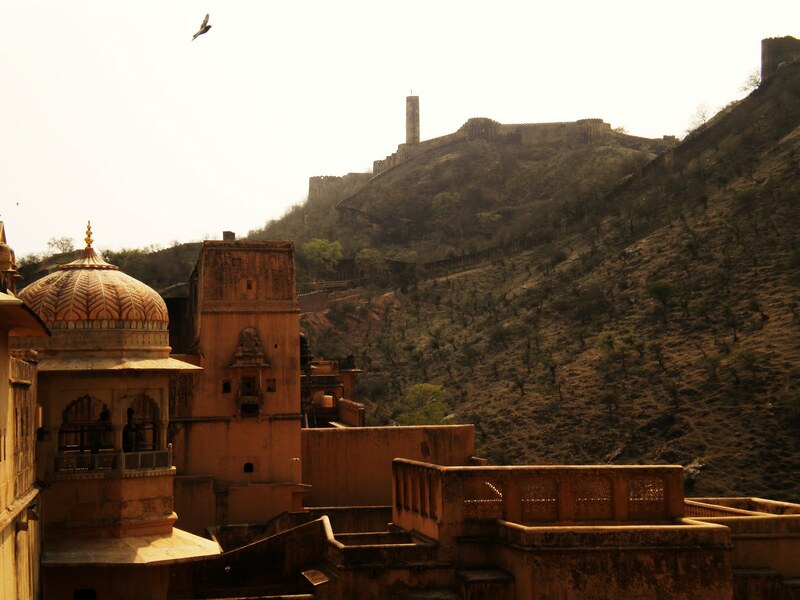 View from the back of Amber Fort, looking up towards Jaigarh Fort, with vulture. The hill is called Cheel Ka Tilla, or Eagle Hill. Pavilion in the palace of Man-Sing I. This the oldest part of the fort. 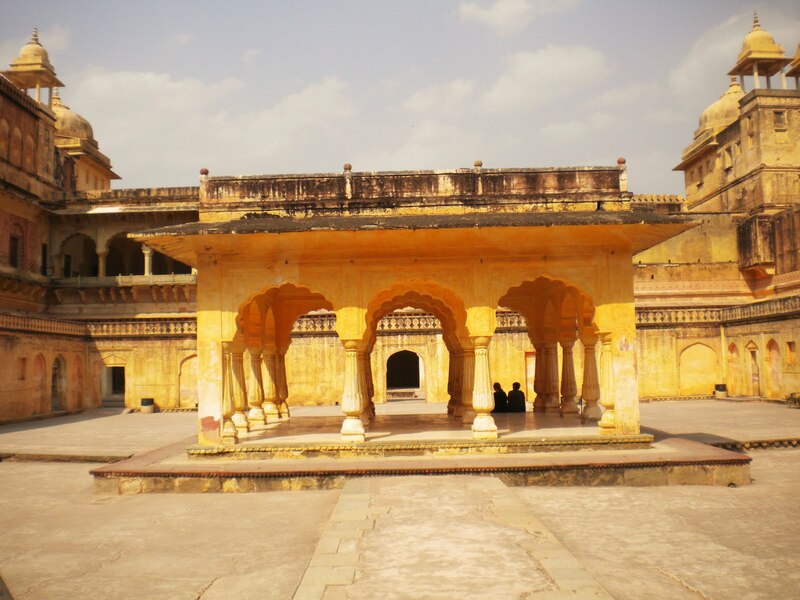 The pavilion was used by the Raja's queens and as private meeting place (with a tarp draped over the top). Just another view of Man Sing I's palace. Amber Fort Bat. 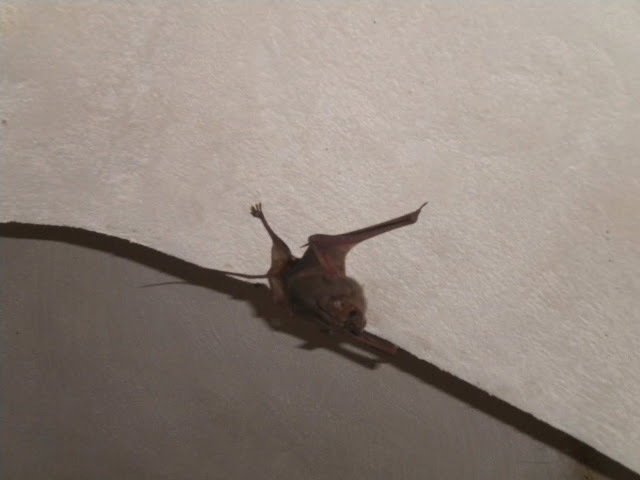 I really don't know why I keep running into bats all the time in India. 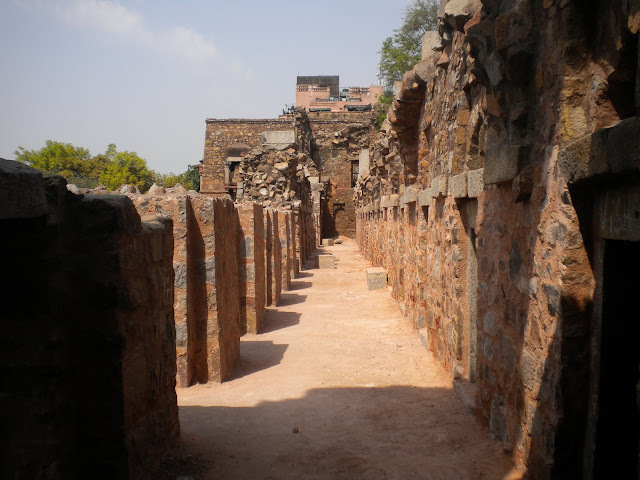 This is in an underground passageway that runs from Amber Fort, through Cheel Ka Tilla, and up into Jaigarh Fort. It's supposed to be about a kilometer long, though only a small portion of it is open to the public. It's difficult to get a good picture of the place, but I would say it was one of the most interesting places inside the fort. 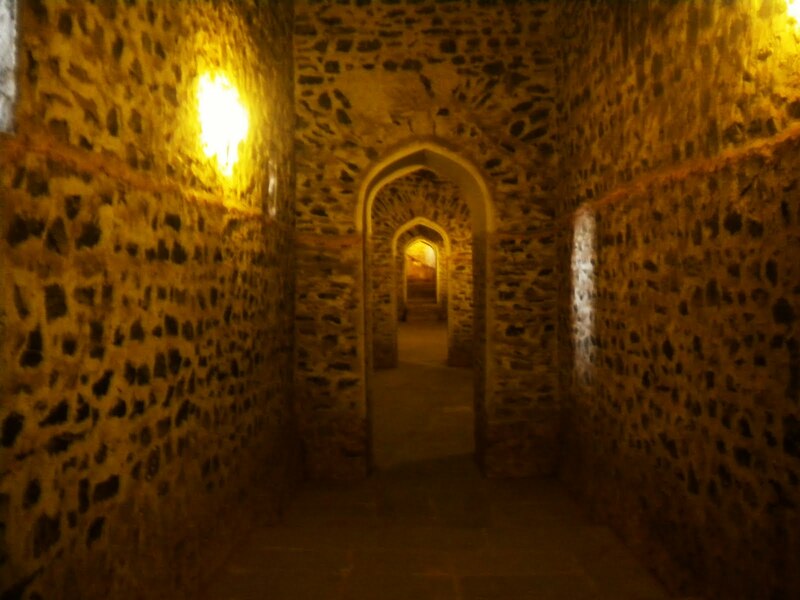 I've always wondered what a medieval underground passage way would be like. However, I think most people who visit the fort pass by it without noticing. 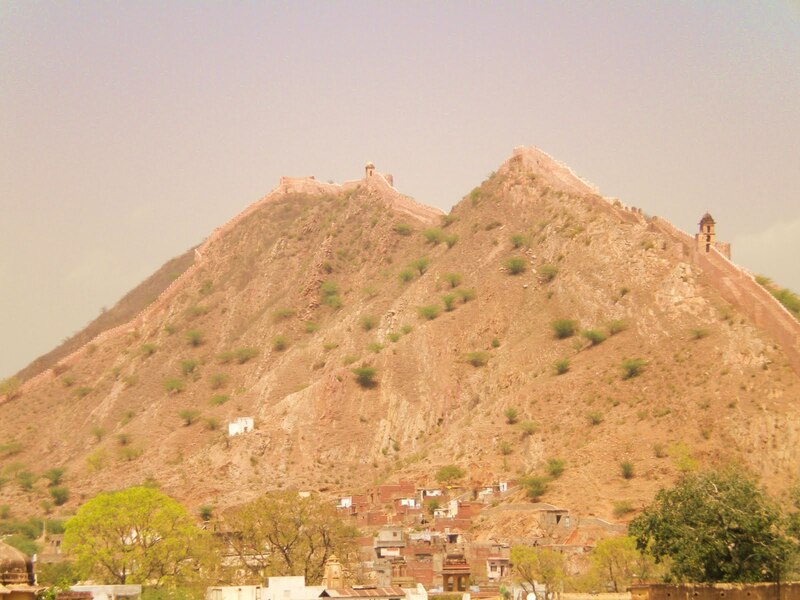 A view on Amber town from the back of the fort, with a number of large temples in evidence. Even now I've never had the chance to go and explore the town properly. 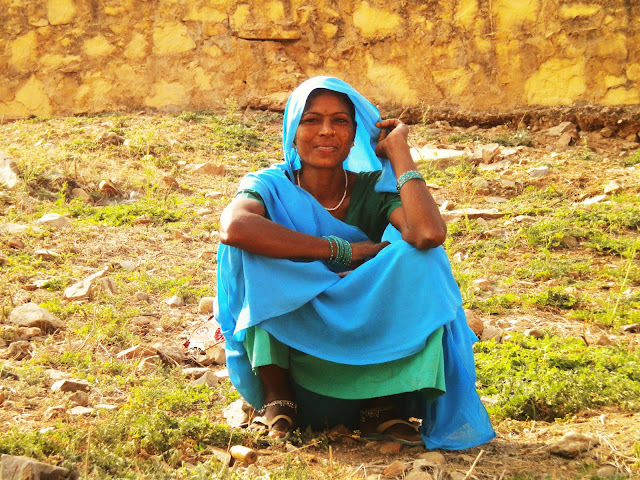 Picturesque Rajasthani woman, outside Amber Fort. As I recall, I had taken a rather circuitous route down from the fort, and sort of came up behind this woman and startled her. She was still willing to get a photo snapped, however. A view of the fort from below. 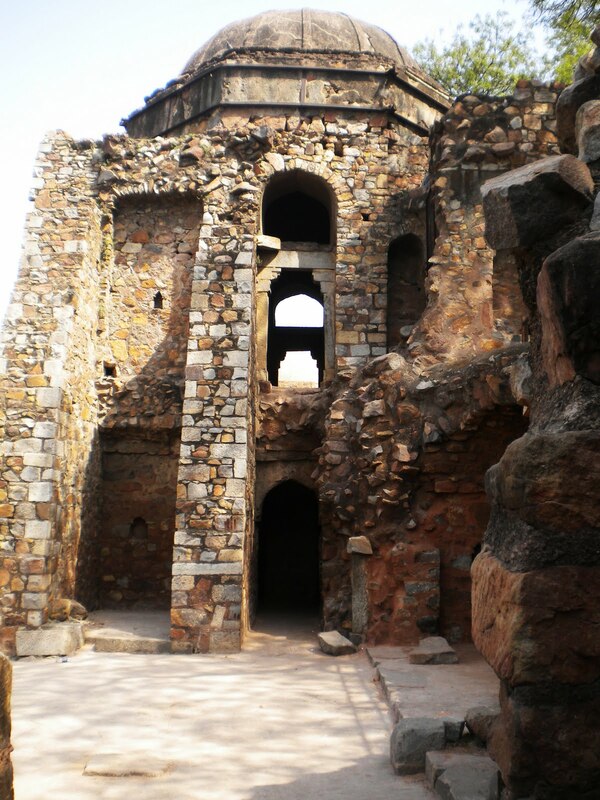 The three large building climbing up the hill like steps are parts of the Fort's waterworks. To the right, you can see the backside of the Sheesh Mahal. The Palace of Man-Sing I is to the left. OK, now we're in Jaigarh Fort...I'm not sure why this photo is in black and white. To the left, you can see part of Amber's crumbling outer defensive wall. In the center is a reservoir called Sagar Lake. Inside Jaigarh Fort. 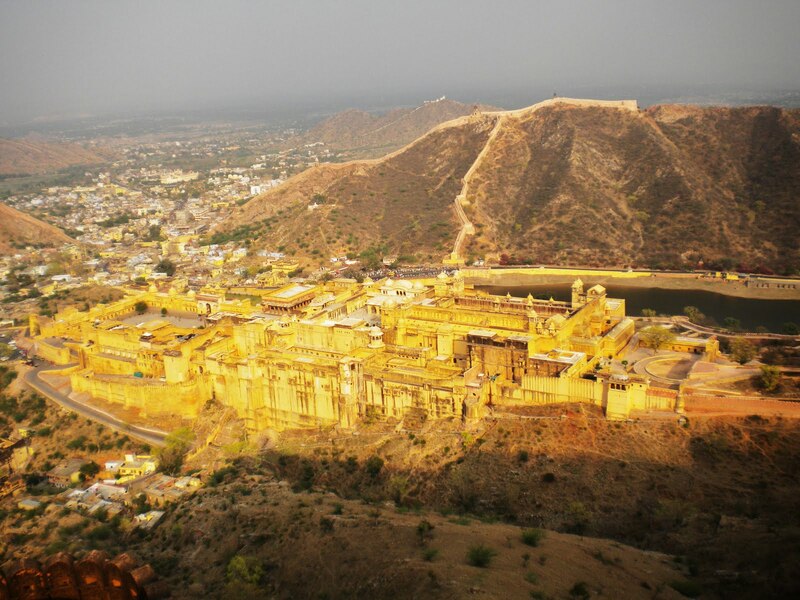 It was evidently built in the first half of the 18th century, much later than Amber Fort, which it was meant to protect. 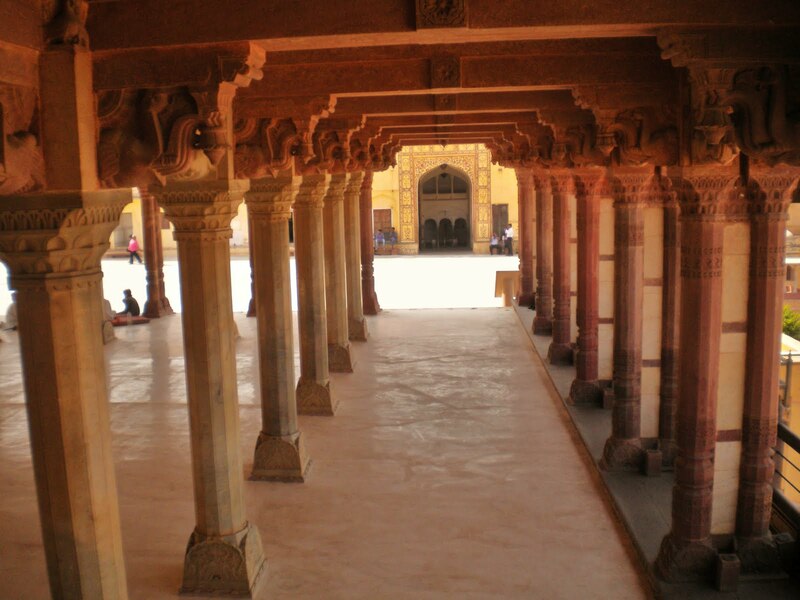 The arches have recently been restored, and are called the "Awani Darwaza." Looking down on Amber Fort from Jaigarh Fort. 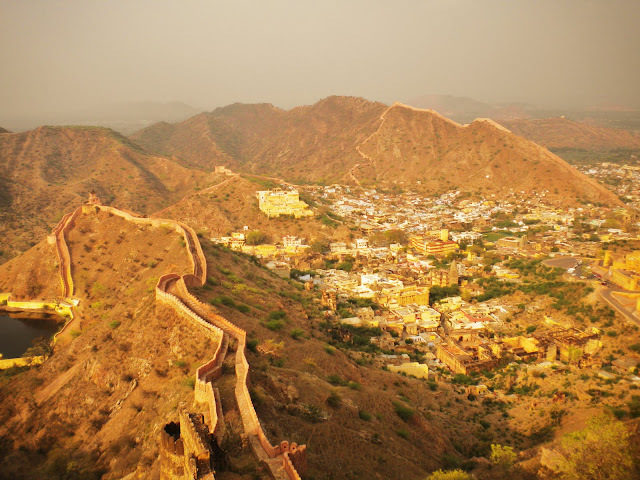 You definitely get one the best views in Jaipur from up there. 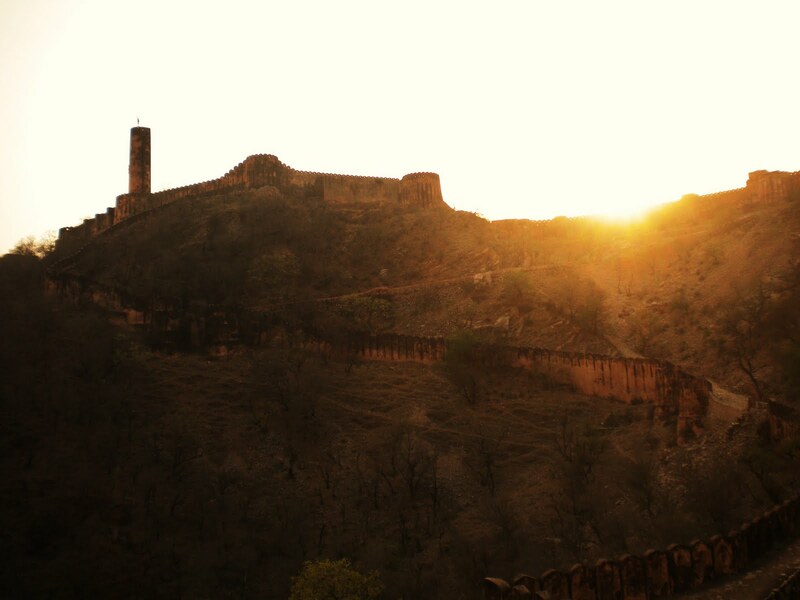 A very orange view on Jaigarh Fort from below, near sunset. You can just see the lines of stairs that lead up to the fort, from Amber below. 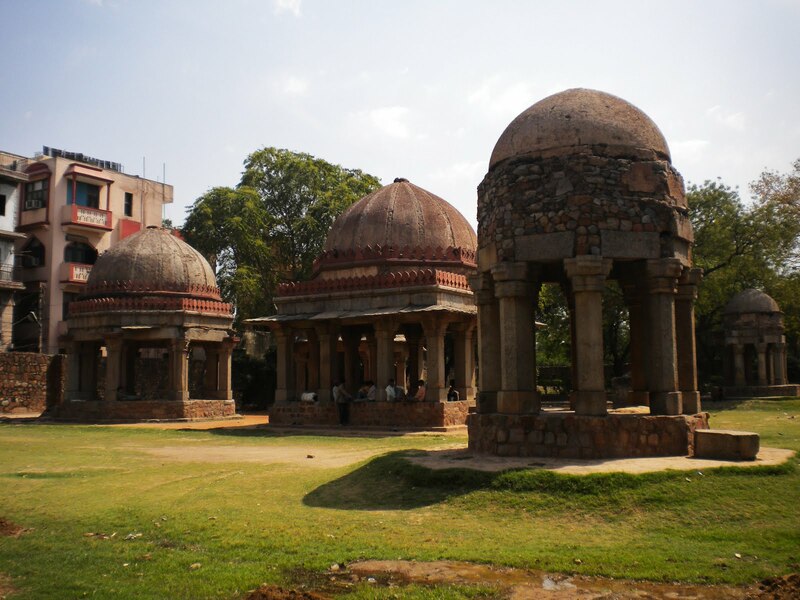 Pavilions in Haus Khas, Delhi. They're part of an old Madrasa built by Firuz Shah Tughluq. The Tughluq dynasty was the third of the Delhi sultanate. They were defeated by Tamerlane (who was an ancestor of the Moghuls) who capture Delhi, and evidently visited this very spot, which impressed him no end. The Madrasa at Haus Khas was for a time the very most important center of Islamic learning in the world. Baghdad, which had held that title before, had been sacked by the Mongols, becoming the capitol of the Ill-Khans. Tamerlane, despite being a Moslem himself, captured Baghdad from the Ill-Khans, and also marched on and took Delhi, subjecting it to the most violent sack in human history. This is where he camped. Looking North, with modern buildings in Haus Khas in the background. The complex was built around a large reservoir excavated by the Khilji's (the second dynasty of the Delhi Sultanate). 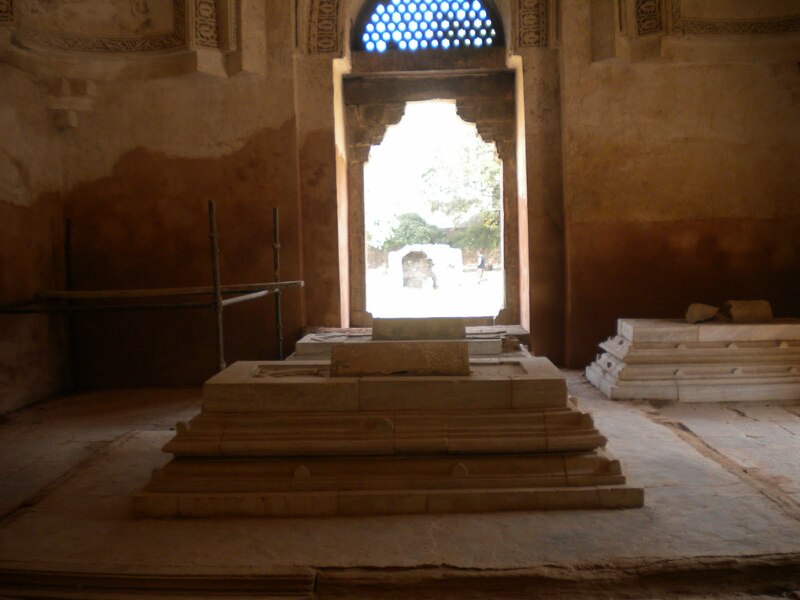 Inside the tomb of Firuz Shah Tughlug. 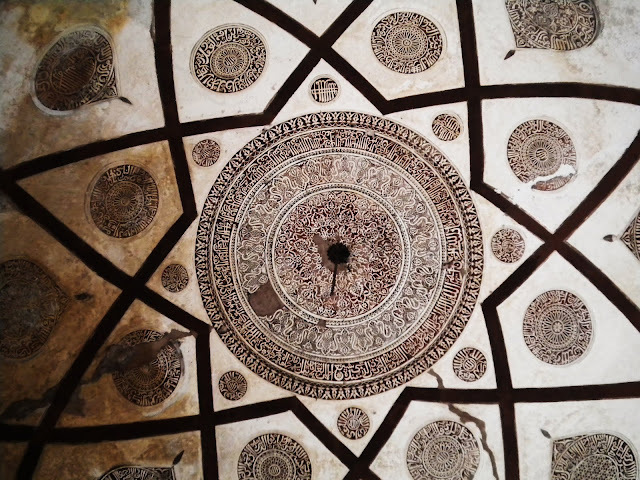 The roof of the tomb of Firuz Shah Tughlug. The only word I can read is "Allah." 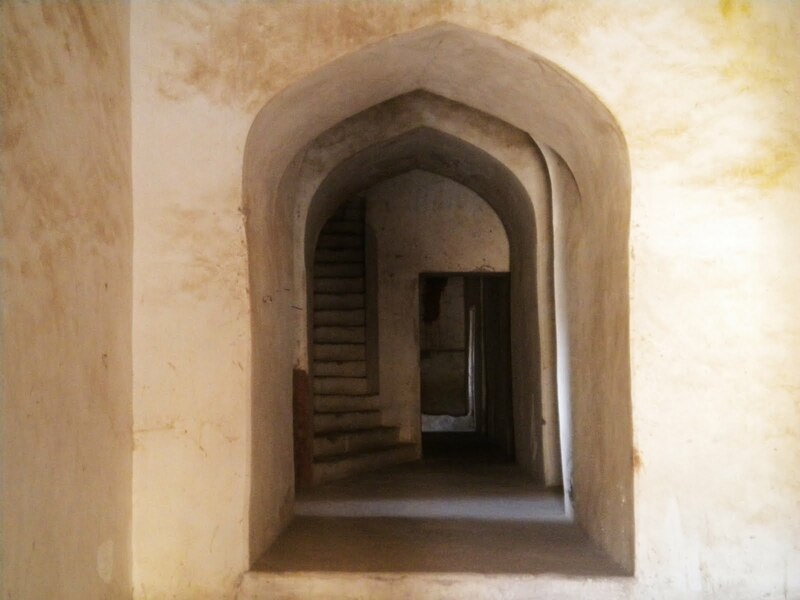 The central building in the Madrasa. It's a very unusual structure, very much unlike any other ruin I've been in. When I was there, the dark rooms of the madrasa were full of amorous couples making out...I wonder what all those generations of Islamic scholars who studied here would think of that. 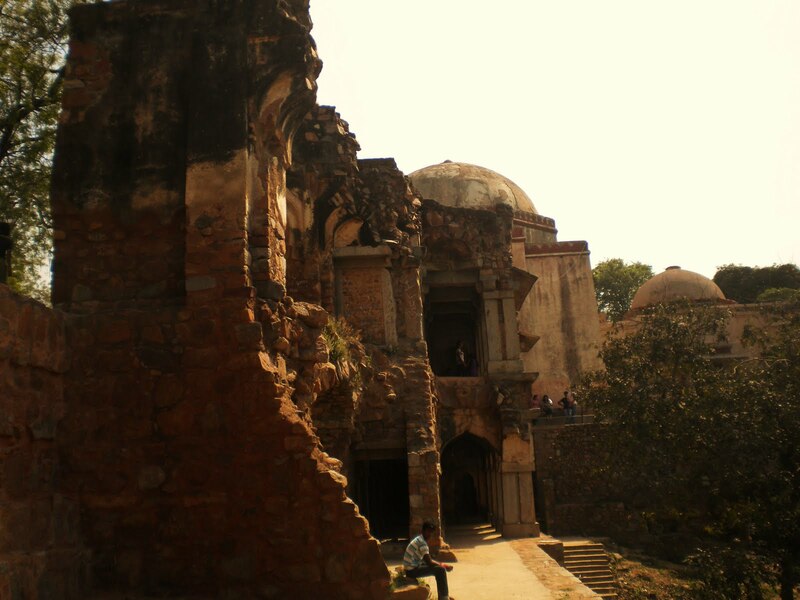 The madrasa itself is really quite a creepy location, and why so many young Delhiites would single out such a place as the perfect spot to make out is a mystery to me. Looking East, towards the back of Firuz Shah Tughlug's tomb. So, that's it for now. Again, I had forgotten about these pictures, so my memory was a little hazy. Next, I'm going to put up some pics of the American West for a change.